Any household or business with children is sure to have plenty of used crayons. 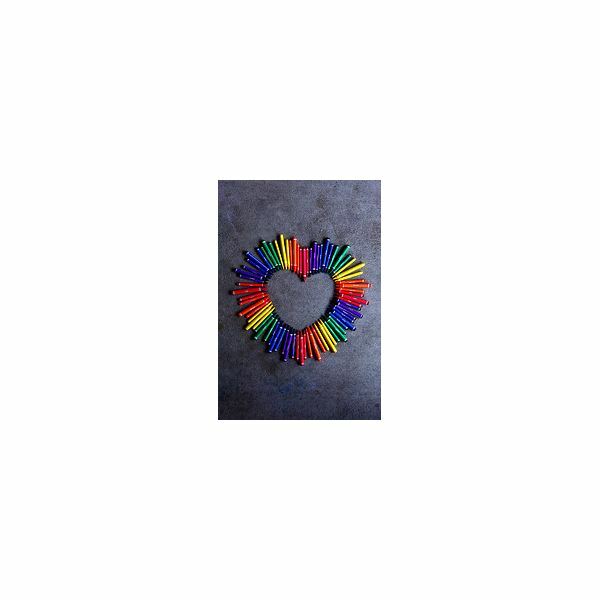 Instead of throwing them away when they become worn down or broken, use these crafts to reuse & recycle crayons. Once you have a substantial collection of broken or worn down crayons, you can create unique multi-colored crayons to enjoy. Preheat the oven to about 275 degrees, and peel the wrappers from all the crayons. If there are any pieces that are still fairly large break them down a bit. Place empty cupcake liners on a rimmed cookie sheet. Fill them a bit less than half full. You can use complimentary colors, crazy combinations, or even all the same color if you want. Bake for approximately ten minutes or until all the crayons have melted together. Be sure not to let the mixture come to a boil or the colors may combine instead of creating a multi-colored effect. Once the crayons have melted carefully remove from the oven and allow to cool for about an hour. Then peel the paper liner off and enjoy your new creation! Preheat the oven to about 150 degrees, peel the wrappers from all the crayons, and break them into small pieces. Select metal cookie cutters in a variety of shapes such as candy canes, wreaths, candles, and Santa hats. You could also use letters if you want to spell a name. Place the cookie cutters on a rimmed cookie sheet. Place the colors within the cookie cutters in order to color your ornaments as you wish. Bake for about 20 minutes, or until the wax melts. Remove the cookie sheet from the oven and let cool for about an hour, or until the wax is cool to the touch. Carefully remove the melted crayons from the cutters. If they do not separate easily from the cookie cutter, place them in the freezer for about an hour and try again. Tie a ribbon around the ornament to hang it from a tree or use it to adorn gifts. Shave the pieces of used crayons using a pencil sharpener. Set aside all of the shavings of each color in their own container so the colors don’t get mixed before you are ready. Choose construction paper in a color that is complimentary to your design such as black for Halloween pumpkins, red for green Christmas trees, blue for a red and white flag and so on. Cut the paper into a 5 x 5 inch square. Put two pieces together and secure with a paperclip, and then trace the desired design onto the top piece. Cut out your design. Place the shavings, in the color(s) you prefer, between two pieces of waxed paper. Heat an iron to low and melt the shavings between the two pieces of waxed paper. Cut the paper down to size and place between the two pieces of construction paper securing with glue or double-sided tape to create a stained glass effect. Perhaps you are not the type that enjoys crafts but still hate the idea of sending more trash to the landfills. Fortunately, it is also possible to recycle crayons. Crazy Crayons has locations in Wisconsin and Florida where groups or individuals can ship their crayons to be recycled. Learning how to reuse & recycle crayons is a great way to teach children about the importance of recycling and repurposing. It is both fun and environmentally friendly, an excellent combination!